Your license to improvise has arrived! Welcome to the ultimate cinematic modern gaming toolkit! based on the wildly popular d20 rules Welcome to the ultimate cinematic modern gaming toolkit! 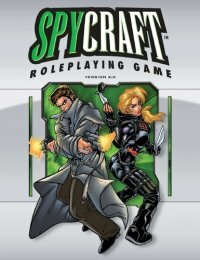 Based on the wildly popular d20 rules system, Spycraft 2.0 offers unprecedented flexibility and utility for any contemporary genre, setting, or storyline. Create your character from thousands of powerful options to take on any enemy, around the world or in your own backyard. Take control of any world you can dream up, from espionage thrillers to back-alley street fights to near future black ops. Everything you could ever want is collected here in this one comprehensive volume. Join the gaming revolution today!